The Sinks Canyon Visitors Center has maps and exhibits. Sinks Canyon State Park is named for its disappearing river. The Middle Fork of the Popo Agie plunges underground into a great limestone cavern called the Sinks only to bubble up into a calm pool a quarter mile downstream at the Rise. The visitor’s center located at the Sinks offers you an introduction to the natural history of the canyon and wildlife. At the Rise you can feed giant brown trout swimming in the pool below. The park, which has earned Trip Advisor Certificates of Excellence for several years in a row, is also a great place for hiking, trail running, climbing and picnicking or camping. 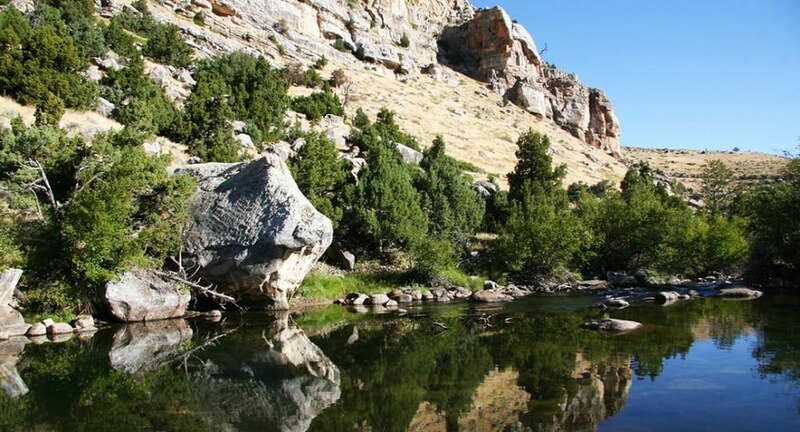 Explore Wind River Country’s hotspots without ever having to leave your vehicle. One of the coolest things to do in Sinks Canyon isn’t immediately apparent when you drive into the park. Boulder Choke Cave is a multi-level cave open for most of the year. (Its closed in late spring and early summer due to high water). You can explore the multiple levels of the cave with a park staff member as your guide. The tour provides adventure, but also a chance to learn about the history of the canyon. There is one tour easy enough that it’s mostly walking and little crouch, while others involve crawling and offer a chance to explore chambers deep in the cave. Some tours are definitely more vigorous than others. The Park staff are helpful and will tailor your tour to your needs. While you do need a staff guide to take you into the cave, it’s free. Call ahead and schedule your tour at 307-332-6333. Escape civilization only minutes from town. Camping in Sinks Canyon is on a first come first serve basis. Situate your tent and you can hear the roar of the river. Check out the stars once the sun sets. And no worries if you forgot the marshmallows—town is only a short drive back down the canyon. There are 24 sites at the Popo Agie campground and four sites at Sawmill. Camping is on a first-come-first basis and from mid-June to mid-July the campgrounds can get crowded. The Popo Agie campground is built into and around the features of the canyon so they aren’t conducive to large RVs. Some of the country’s best climbing is found in Sinks Canyon, with sandstone, granite and of course limestone routes. There are hundreds of routes ranging from beginner options to those that can challenge experts. Guidebooks to the area can be found at local outdoor gear shops. If you aren’t a climber, but tempted to try the sport after watching people scale the walls, you can contact the professional guide service below. Don’t forget your quarters—even if you don’t have kids. This might sound corny, but the trout that hang out at the rise go insane when you toss in the fish food you can buy from the machine for 25 cents. In 1919 a stone power generator was built near the area and fishing became illegal. Since then the fish- mostly brown and rainbow trout- have thrived. They fish are not stocked, but swim upstream to spawn when they hit the dead-end of the rise. Some have grown to the 15-pound range. They go crazy when you throw in food: The water churns and the red side of the Rainbow’s flash in the sun. Sometimes you’ll get bold ducks and birds that brave the fray for a little food. It’s worth the 25 cents. Stretch your legs walking on the sidewalk between “the Sinks and the Rise.” It’s about a quarter-of-a- mile between the two sites on a paved path. Looking for a quick lung burner? A new trail off the pathway, called the North Slope Trail, climbs the hillside and travels above the visitor’s center and provides remarkable views of the canyon before dropping down to tie into the Nature Trail. It’s only about a mile long, but beware, there is a steep section. Just down the canyon is the Nature Trail: The parking lot is marked with a sign. Cross the suspension bridge and enjoy a lovely one mile loop. If you are looking for something a little longer, the Canyon Loop starts at the same trailhead and provides a four mile hike that ties into forest service land. 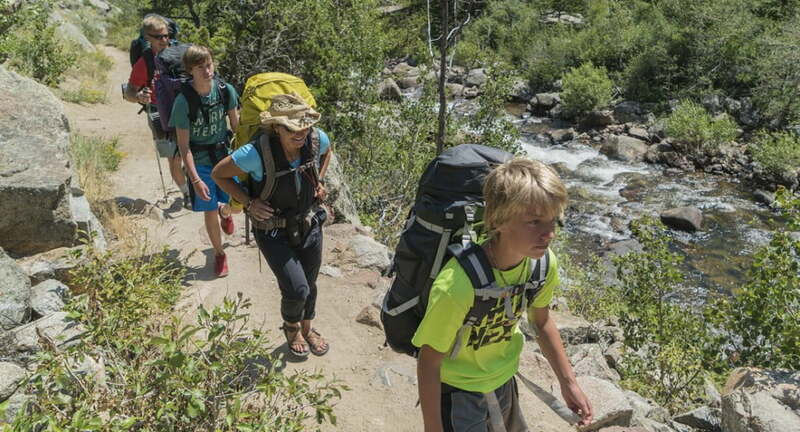 The hike is mellow enough for families and a perfect activity for those choosing to camp in the canyon. At the end of the canyon, just outside the park boundaries and before the road begins to switchback up the hillside is Bruce’s parking lot. This is the starting off point for hiking to the Popo Agie Falls, the canyon’s most famous hike. Cross the street from the parking lot and head across the bridge. Take a left at the trailhead sign and follow the path the 1.5 miles to a large cascading waterfall.